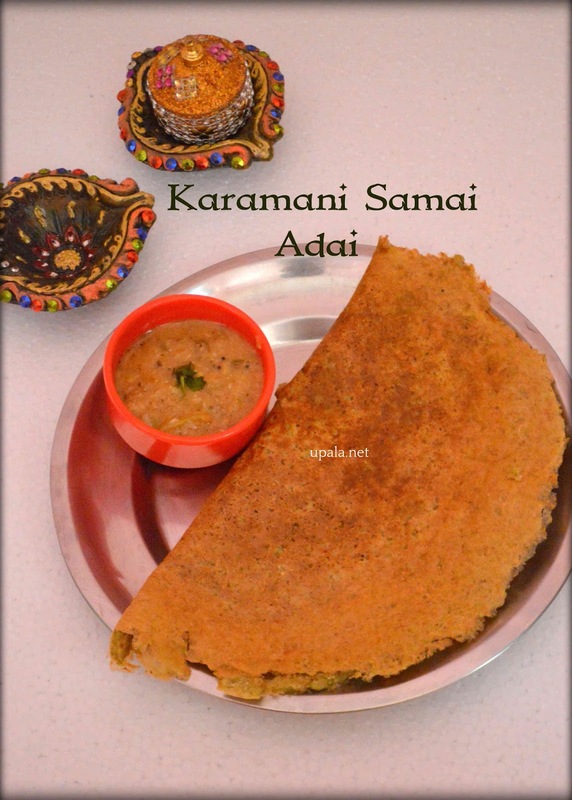 Sprouted Karamani Samai Adai/ Red Cowpeas millet adai is a tasty adai prepared with healthy ingredients. This adai gives combined health benefits of both Karamani and Samai millet as both of them are so good for all health issues and especially for diabetic, high cholesterol etc. 1) Wash and soak Karamani overnight. Next day, drain water and transfer to a cotton cloth, wrap and tie it. After 5-6 hours, small sprouts will start developing. 2) Soak Samai arisi for 3-4 hours. 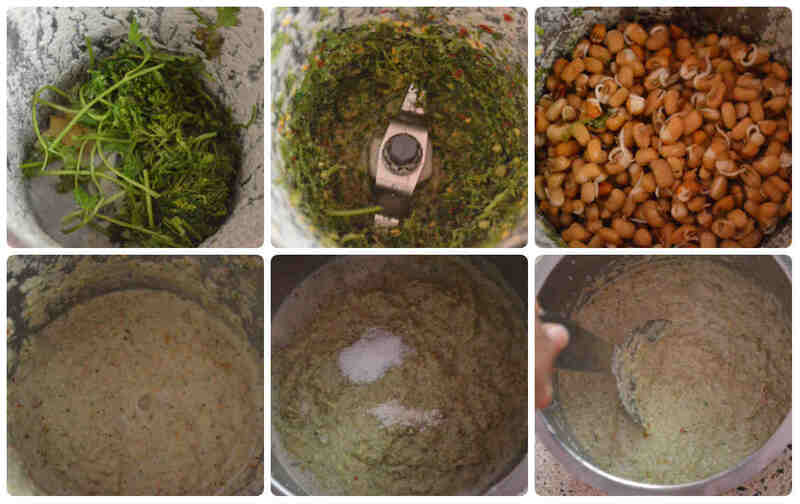 3) Transfer the soaked samai arisi to a mixer and grind to smooth paste. Transfer the samai batter to a container. 4) Add Ginger, red chilies, Coriander leaves to mixer Jar and grind to coarse mixture. 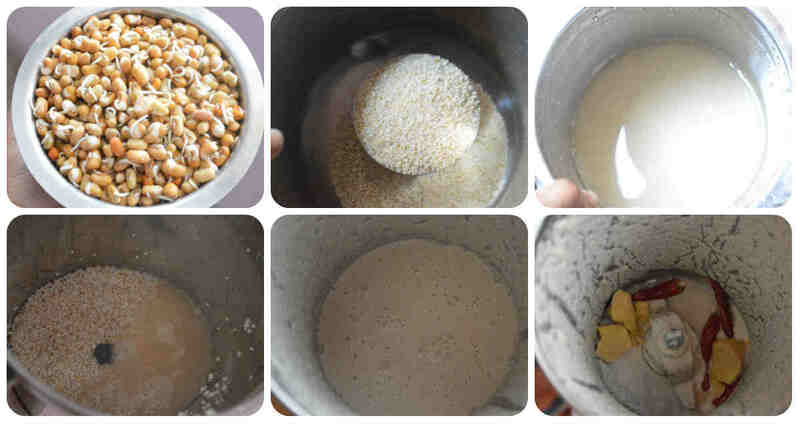 5) Transfer the sprouted Karamani to mixer and grind to smooth paste. 6) Transfer the karamani paste to samai batter, add salt, hing and mix well. 7) Heat a dosa tawa and drizzle some oil. 8) Take a ladle full of batter spread them in a circular way. Drizzle oil on sides to leave it to cook on medium flame. 9) After one side is cooked, flip it to cook on other side. Drizzle some more oil for the other side. After both sides turn light brown, remove from tawa and serve. Healthy Sproted Karamani Samai Adai is ready..
1) You can add Green chilies when grinding if you want extra spicy. 2) You can add finely chopped onion to batter to make onion adai. 3) You can even add grated carrot, cabbage, finely chopped capsicum or any of other veggies according to your preference. 4) You can add 1/2 cup grated coconut to batter. Instead of grating, you can even finely chop the coconut into small pieces and add.